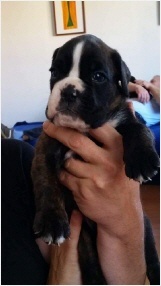 can be found on the puppy page of our website. 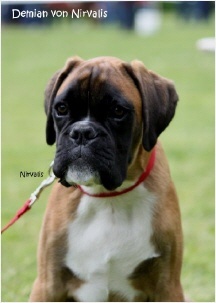 On 28.05.17 our E-litter von Nirvalis was born. 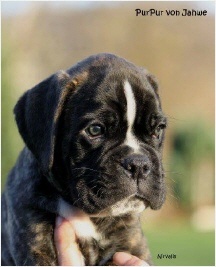 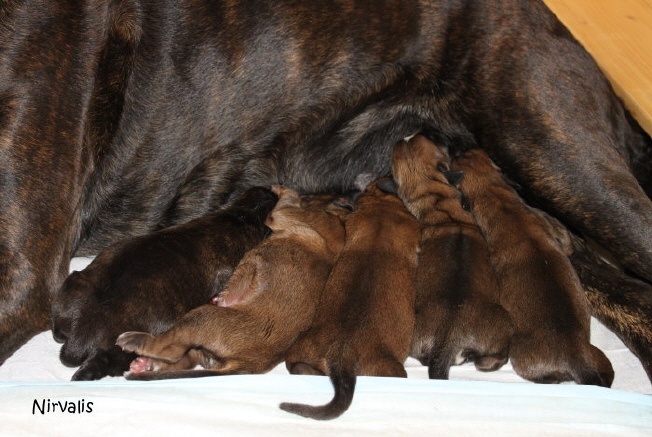 We are happy about 3 brindle males and 2 brindles females. 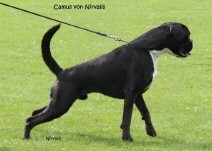 Camus von Nirvalis was awarded with the title Champion of Czechia. 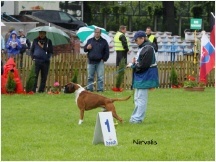 Now he meets all conditions for Champion of Czechia. 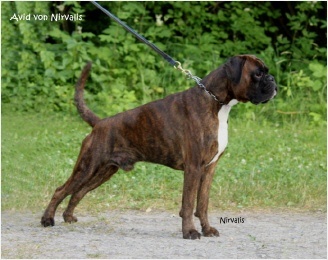 Kennel Bicadara's got puppies of Birke von Nirvalis & Garrett Shucky. 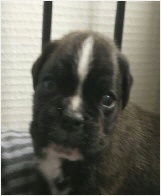 has been mated to Camus. 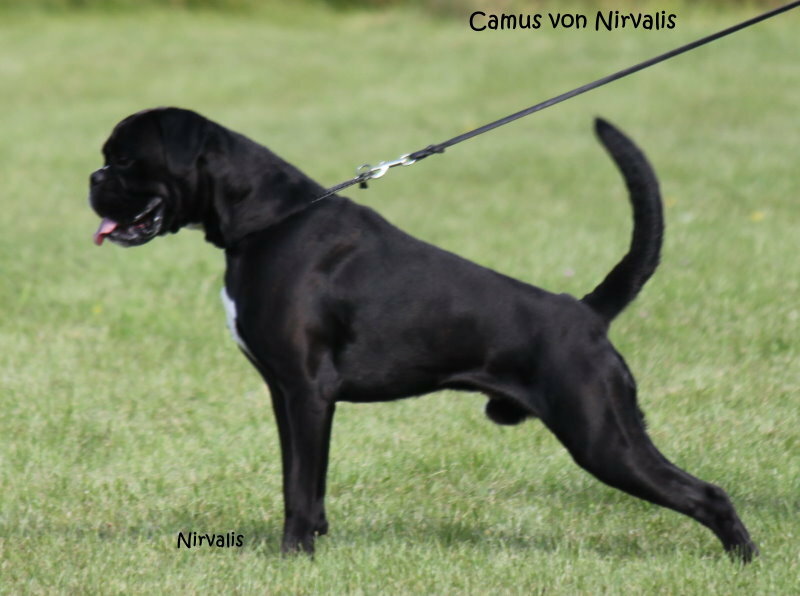 Camus von Nirvalis was awarded with the title Deutscher Champion (VDH). 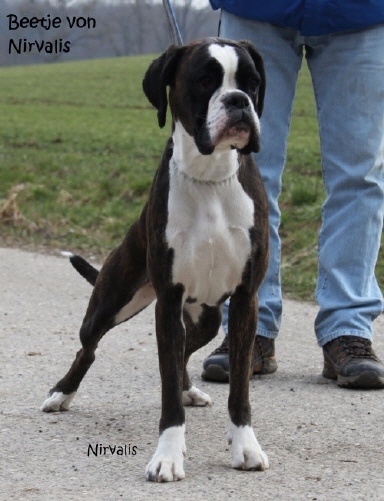 at BK Wurzen the IPO1 (TSB a) test successfully ( judge M.Felber ). 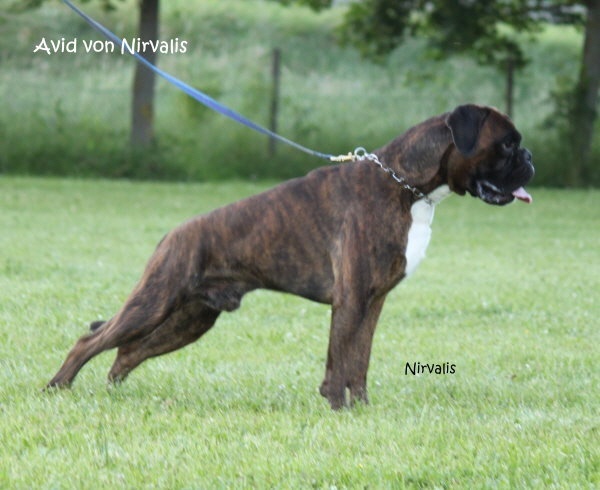 Camus von Nirvalis passed together with his handler Erich Ullrich the BH test at SV OG Kitzingen (Judge G.Ernst). 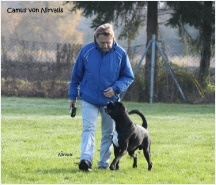 On 15.11.2014 Camus von Nirvalis successfully passed in Pilsting the ZTP (BK München) with excellent bite work and a perfect description by judge Toni Piasentin. 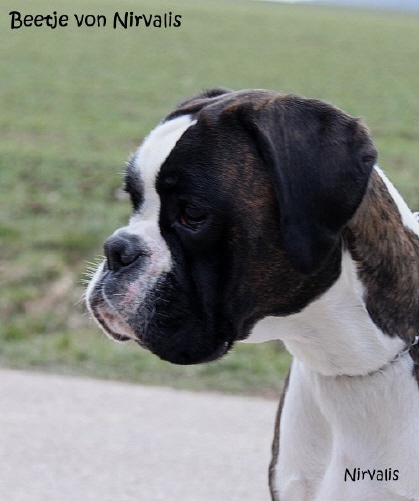 "Bei allen Kampfhandlungen kompromissloser Anbiss bei voller Belastung." 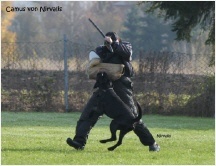 homolagated to the title "VDH Bundessiegerin 2014". 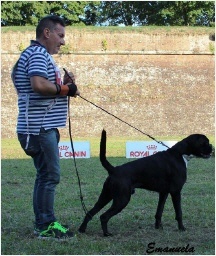 We also showed a progeny group of Elodi dei Centurioni with 8 children out of 4 litters of 4 different fathers, which was judged as "excellent". 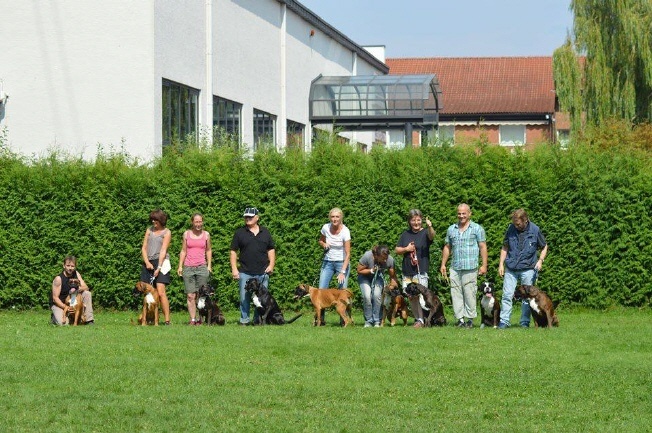 Thanks to the Elodi children Avid, Birke, Beetje, Caramel, Cappucchino, Camus, Daylight, David & Demian and their families for this wonderful day ! 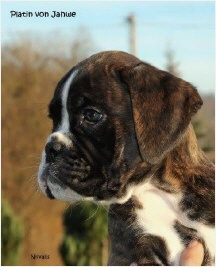 ( judge U. Horst ). 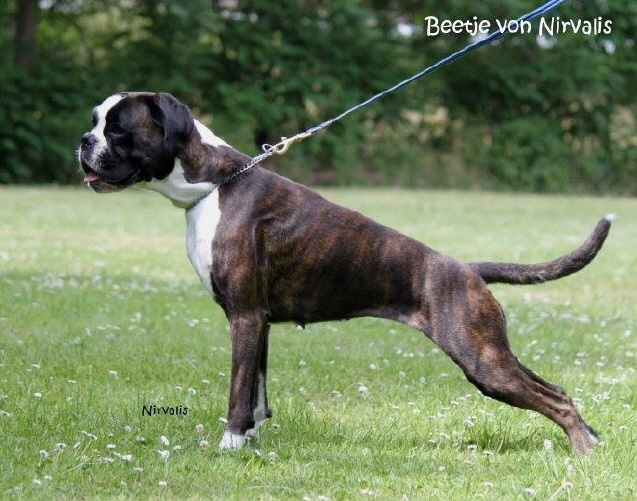 Beetje now has got 10 times Excellent 1 + Anw.Dt.Champ. 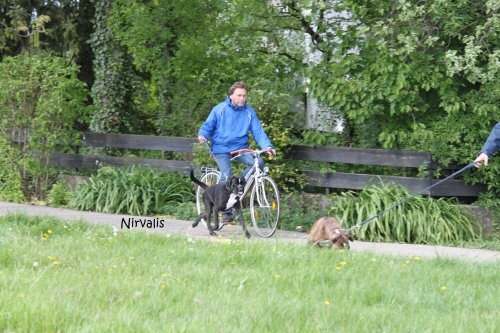 (VDH) in a row. With this Camus has already been awarded 3 times for Dt.Champ. 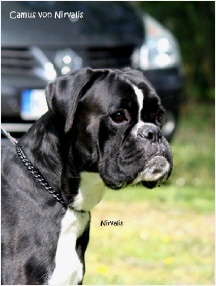 (VDH) in the age of only 17 months. 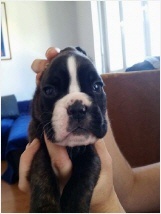 With this 9. 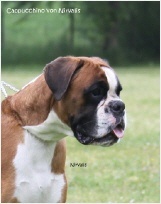 Excellent 1 + Anw.Dt.Champ. 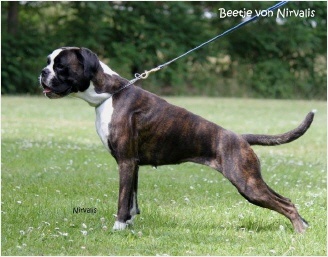 (VDH) in a row, our Beetje von Nirvalis finished the title Deutscher Champion (VDH) in the age of less than 2 1/2 years. 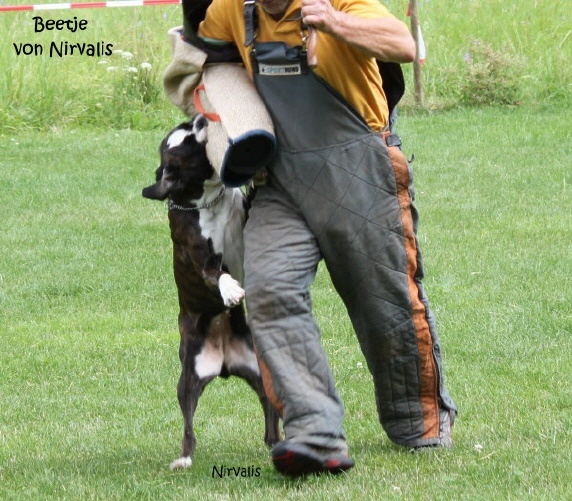 Our Beetje has got now 8 times in a row V1 plus Anw.Dt.Champ.(VDH). 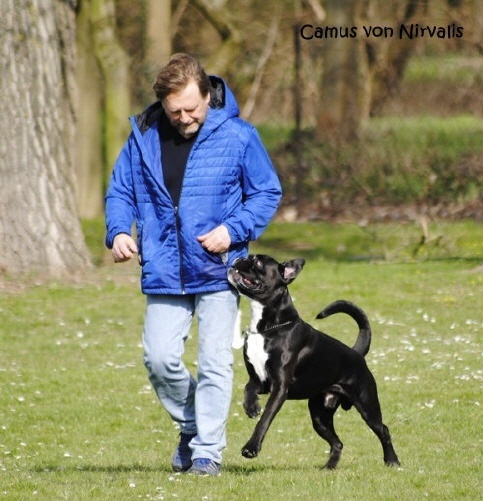 On 18.04.14 Camus von Nirvalis passed successfully the AD test ( Judge B. Spelsberg ). 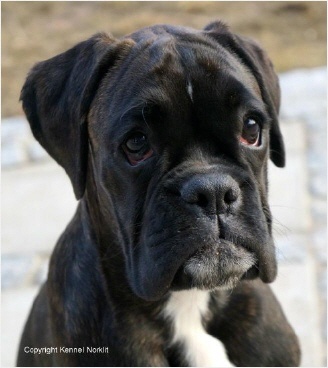 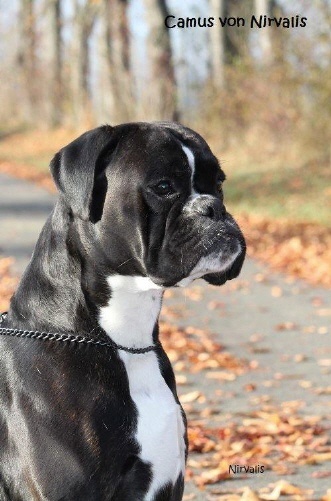 Our Beetje von Nirvalis got at Special Boxer Show Bergstrasse by judge U. Heidelberg in working class now 7 times in a row V1 plus Anw.Dt.Champ.(VDH). 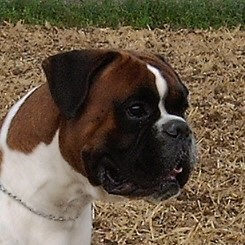 we were shocked when it was suddenly dark. 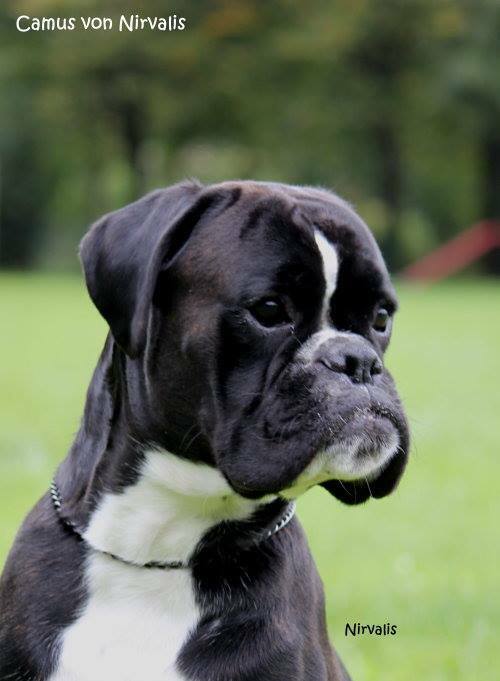 On 06.01.14 our Karlino celebrated his 13. birthday ! 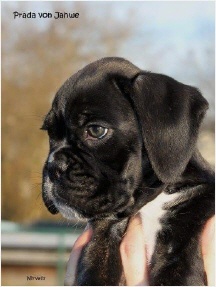 On 21.12. our D-litter of MCh. Zucchero Nostrum and MCh. Elodi dei Centurioni was born. 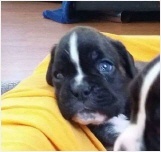 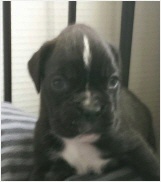 We are happy about 2 fawn males, 1 brindle male and 2 fawn females, all with small white markings. 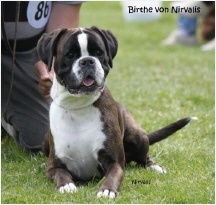 Our Beetje von Nirvalis got at IRAS Kassel in working class again V1 plus Anw.Dt.Champ.(VDH). 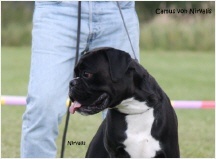 Additionally she was again awarded by judge U. Heidelberg to CACIB. 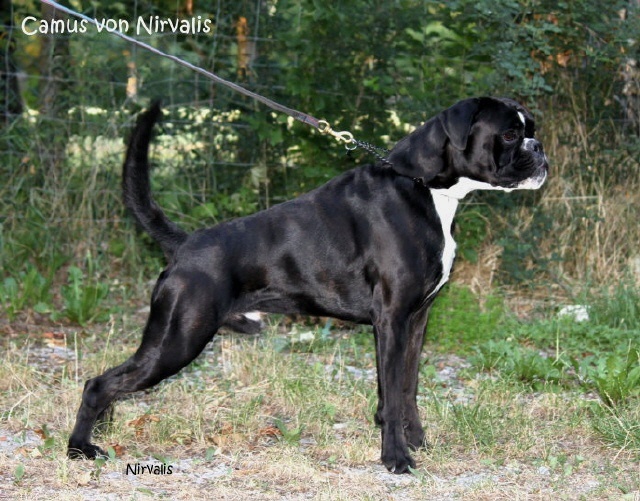 So after 6 times in a row V1 + Anw.Dt.Champ. 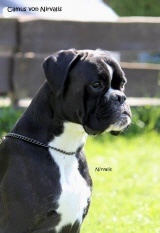 (VDH) by 6 different judges, 2 CACIB, good health results, AD, ZTP, BH and IPO-VO we'll take a winter break. 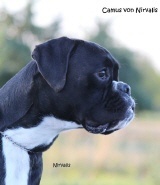 Beetje and her two littermates Birke and Birthe got the result "spondylosis 0". 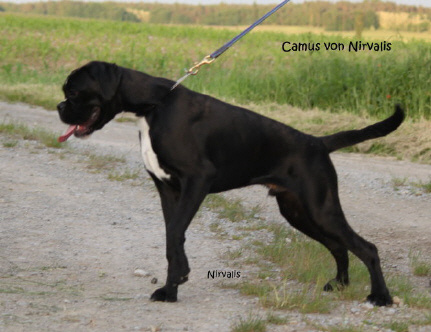 Camus von Nirvalis got the result "heart 0". 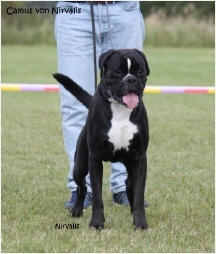 Our Beetje von Nirvalis got at IRAS Karlsruhe in working class now 5 times in a row V1 plus Anw.Dt.Champ.(VDH). 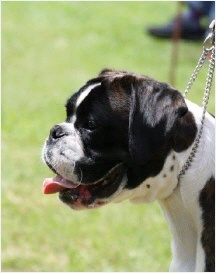 Additionally she was awarded by judge B.Jodl to CACIB. 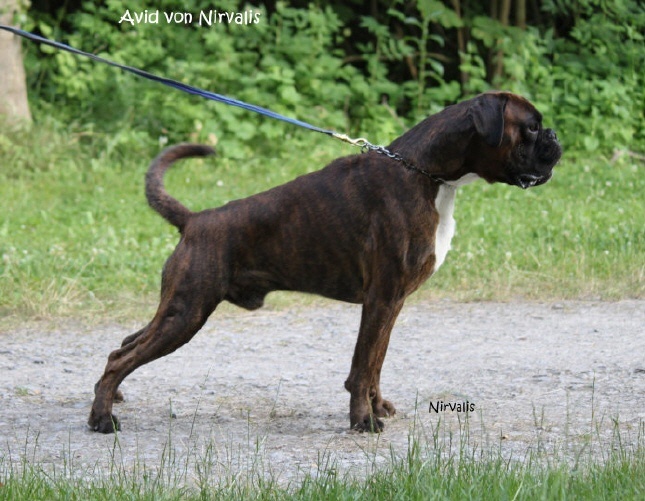 On 26.10.2013 our Beetje von Nirvalis passed successfully ZTP and AD at Boxer-Klub Würzburg. 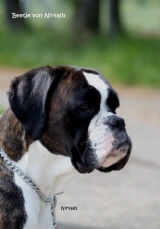 On the following day she got V1 + Anw.Dt.Champ. 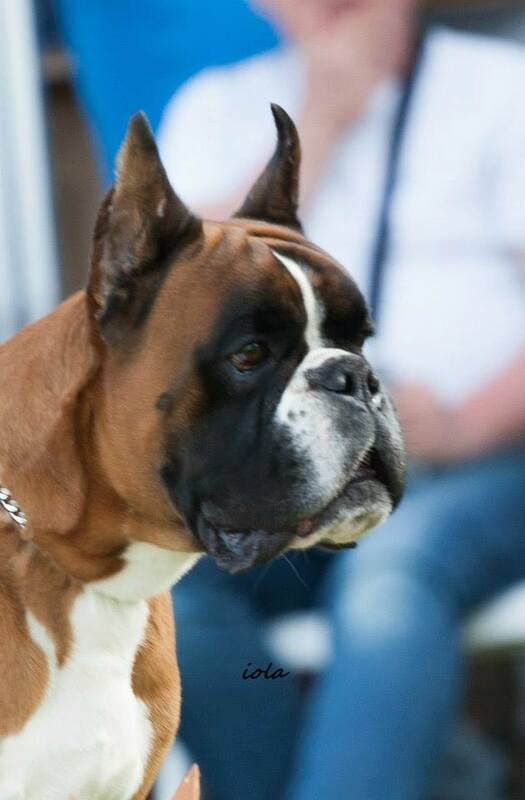 (VDH) in working class at the Special Show Rüsselsheim. 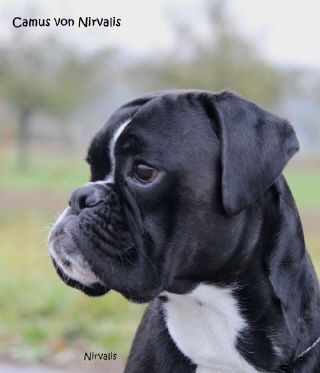 Judge was Brigitte Müller. 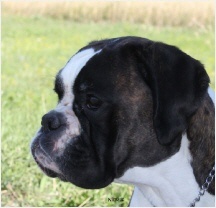 On Christmas MCh Elodi dei Centurioni is expecting puppies of MCh Zucchero Norstrum. 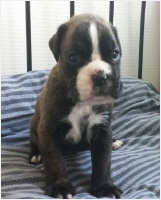 All further informations you can find on our puppy page. 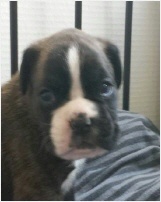 Please contact us if you are interested in a puppy. Camus von Nirvalis erhielt bei seiner ersten Ausstellung mit 9 Monaten in der Jugendklasse ein "sehr gut" mit einer tollen Beschreibung. 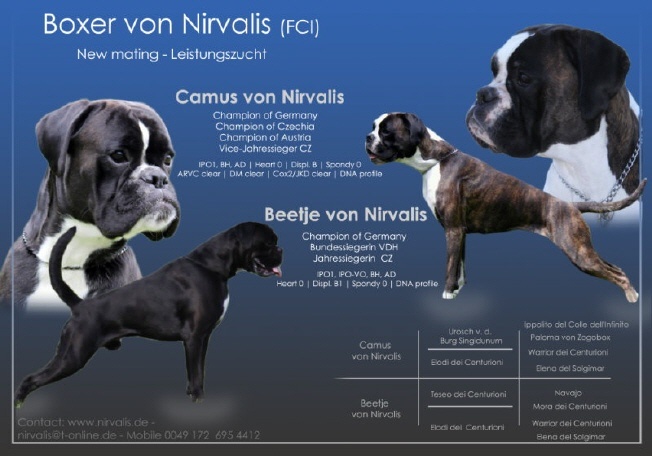 Über das gleiche Resultat freut sich Coffee von Nirvalis mit ihren glücklichen Besitzerin Ida & Kare. 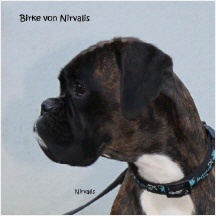 Birke von Nirvalis erhielt in der Zwischenklasse ein "vorzüglich" mit einer sehr schönen Beschreibung. 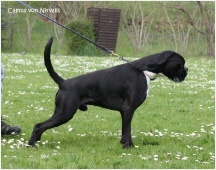 Beetje von Nirvalis konnte sich in der stark besetzten Gebrauchshundeklasse als jüngste Starterin über ein *V5* freuen. Vielen Dank an unsere Freunde mit ihren Nirvalis-Boxern, mit denen wir ein tolles & harmonisches Wochenende verbracht haben ! At her first start in working class Beetje got now three times in a row excellent 1+ Anw.Dt.Champ. 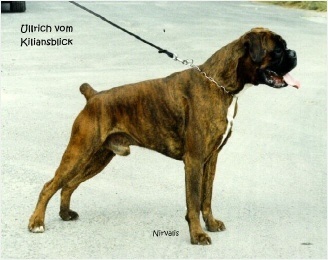 (VDH). 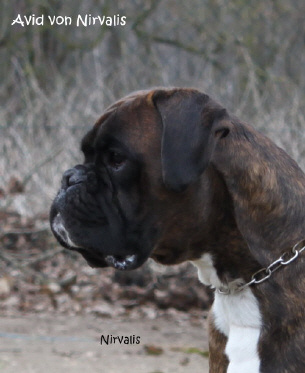 On 14.04. 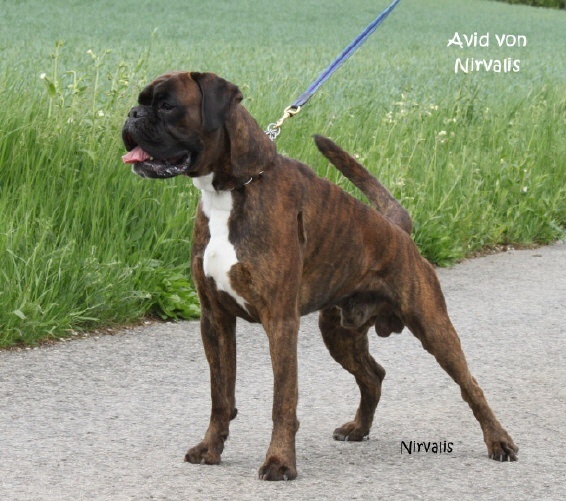 Avid von Nirvalis passed the IPO 1 test successfully at BK Sulmtal. 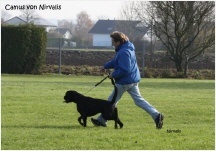 Beetje von Nirvalis reached at the same event IPO-VO. 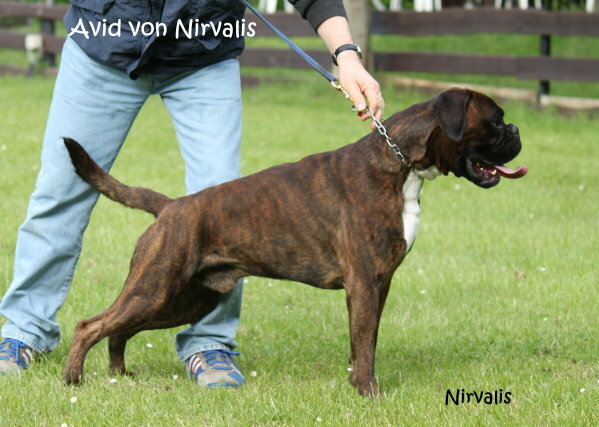 On 18.06.13 our Avid von Nirvalis got the title "Deutscher Champion (VDH)"
in the age of only 2 1/2 years. 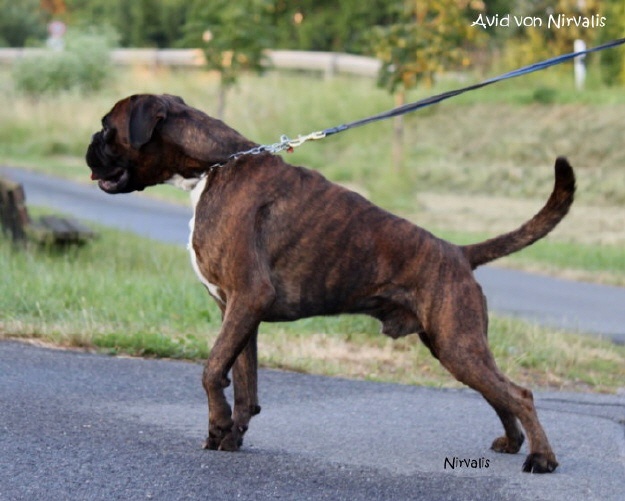 Avid von Nirvalis again got V1 + Anw.Dt.Champ. 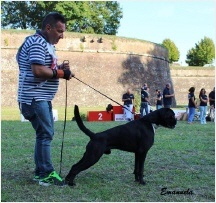 (VDH) in open class at the Internat. 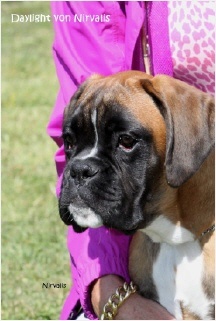 Dog Show Dortmund. 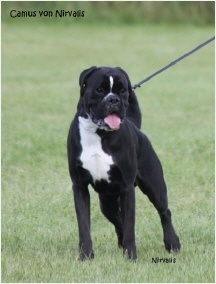 Judge was Angelika Hartmann. 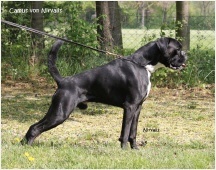 So he fulfils within only one year and 4 days all requirements for the title Deutscher Champion (VDH). Avid has got 5 times in a row V1 + Anw.Dt.Champ.VDH by 5 different judges ( I.Gerwin, B.Müller, B.Jodl, U.Werner & A. Hartmann ). 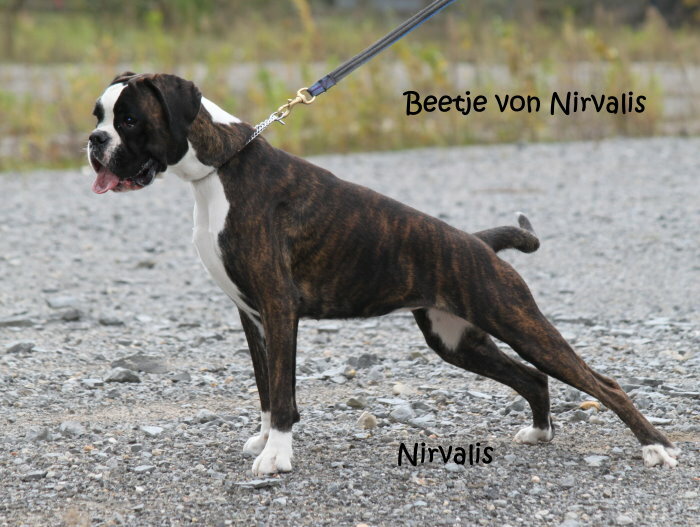 Beetje von Nirvalis again got V1 + Anw.Dt.Champ. 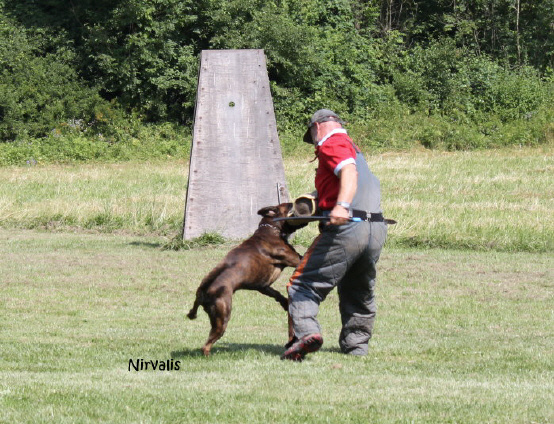 (VDH) in intermediate class at the Internat. 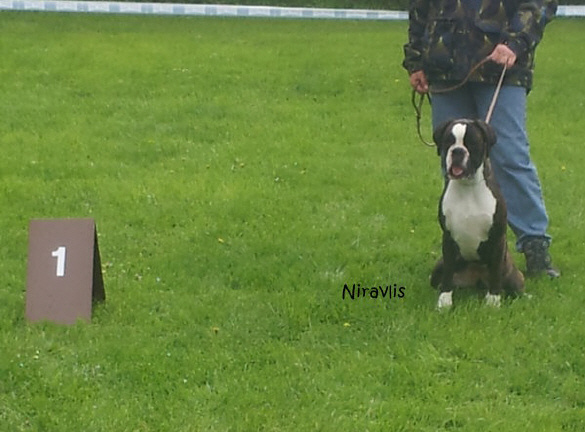 Dog Show Dortmund. Judge was Angelika Hartmann. 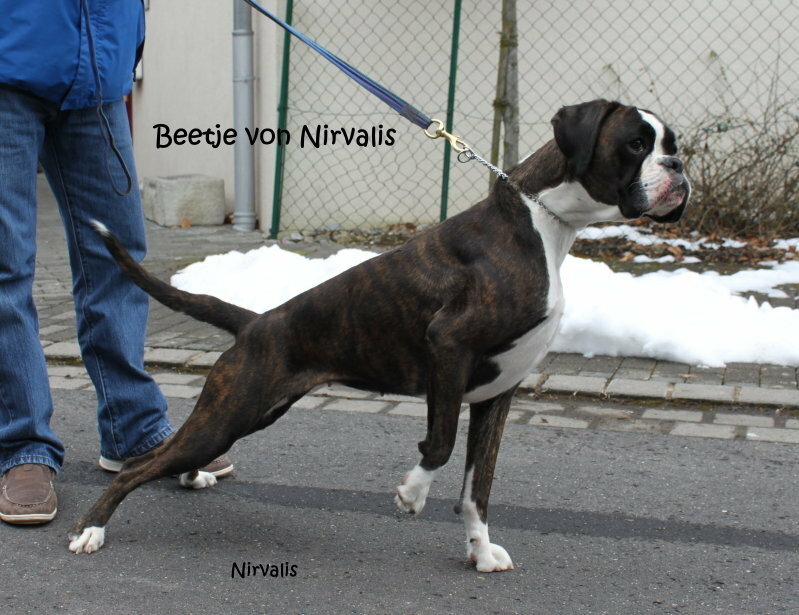 On 07.04.13 our Beetje von Nirvalis has passed the BH/VT test in the age of only 16 months at BK Rüsselsheim ( Judge U.Horst ) successfully. 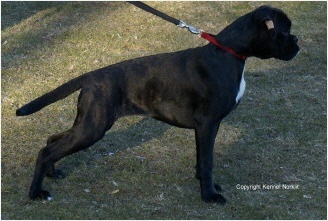 ( x-ray in the age of 28 months ). 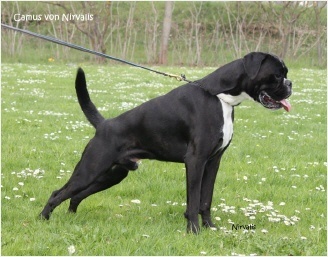 the dysplasia result B1 of our Beetje von Nirvalis. 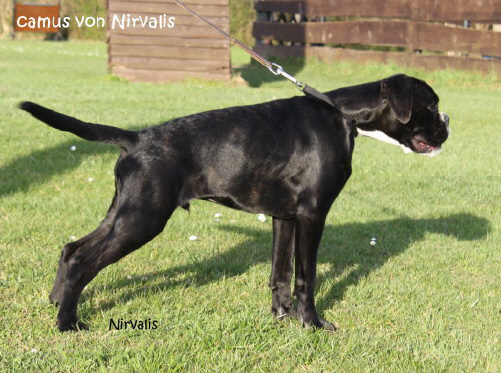 On 23.03.13 our Avid von Nirvalis has passed the BH/VT test in SV OG Uffenheim ( Judge P.Dittmeier ) successfully.